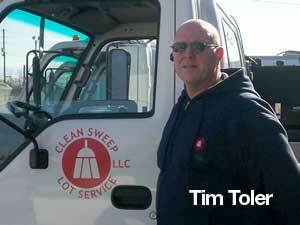 Tim Toler saw an opportunity in the pavement cleaning business and took action. From starting with a broom and a wheelbarrow, Tim Toler has grown his company a long way. For eight years Tim Toler did outside maintenance for a developer. Noticing that a store in the area wasn't keeping its lot clean, Toler contacted the manager, who put him in contact with the management company. He not only got a contract to do that property, but nine others managed by the same firm. For a couple years, Toler and his son continued to clean the properties by hand, while continuing with his full-time day job. Coupled with starting to go to church on a regular basis, he says he came to the realization that there was enough money in other people's trash to quit his regular job and go full time with sweeping. Deciding that if he was going to have truck payments then he'd just as well have a new sweeper, Toler went out on a limb and bought a new Schwarze 347-I. After having walked lots for many years in his work for the developer, with sparing use of a Tennant sweeper -- walking the soles off many pairs of shoes in the process -- the overnight transition was enormous. At first, he found himself still spending four to five hours on a property that previously took eight but now should be done in about three. Even then, one property manager simply could not be made happy. "However, I came to a realization," Toler says, "that my time had to be worth much more than $10 an hour. That was the beginning of figuring out my actual costs and the pricing that needed to go with it." 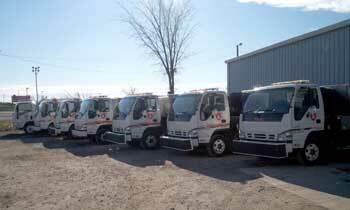 For years, Toler's company ran an all-Schwarze fleet of parking area sweepers. Once Mark Schwarze got back into the business with his new Victory Sweepers' line, however, Toler says he has switched to those. "I really appreciate the difference in the customer service and support I get with Victory," Toler said. "The Victory sweepers are also more than competitively priced and are simply better machines." Toler also has praise for his new Challenger broom sweeper. Although not a big broom machine like those in the Schwarze or Elgin line, he says he's been using it for millings' pickup in the range of four-to-five inch debris and had no problems. He recommends the Challenger as a relatively inexpensive way to get into the broom sweeping arena. As you will hear in the audio interview, Toler credits his company's growth with providing a good end product for his customer and always doing whatever he says he'll do, period. That has brought him both growth and a high degree of customer loyalty. Note: The following audio interview with Tim Toler is approximately 26 minutes in length, and will play without downloading any files onto your computer. If you hear the interview at 'chipmunk speed,' you will need to download the latest version of Adobe's free Flash player. Note: To play the interview, click this link or on the small triangle inside the circle you see to the left. If you have any trouble accessing this audio, please let us know. Tim Toler may be reached via email, or by calling him at 317-339-5722. If you have questions or comments about this interview, please, let us know and we can add it in as an addendum to this article.